Bracelets - These are the perfect everyday bracelet, and would be a great gift for a friend or mom. PJs - I have two pairs of these jammies and they are the softest I've been able to find. Fit is true to size. Candle - This french cade lavender candle is my all-time favorite candle scent. It makes our home smell so nice and fresh without being overpowering. Joggers - I was on the hunt for the perfect joggers and finally found them. These are high-waisted and a soft thick material. They're perfect for around the house or running errands. Body Wash - I fell in love with this luxury body wash after staying at our favorite hotel in the Bahamas. Perfect for a coworker or stocking stuff. 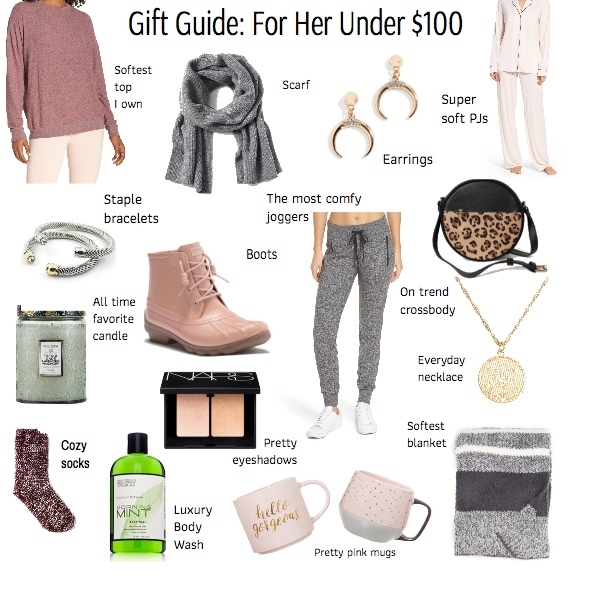 What a great selection of gifts for her! My daughter would love those bracelets and I love everything leopard so I'm checking out that crossbody bag. Thanks for the shopping list! Yay! Glad I could give you some ideas to check off your list. Thanks for stopping by! Thank you! Yes, such a good partner to a gift. This is a list you can’t go wrong with! I especially love the PJs idea! My mom always bought us PJs each Christmas! Thank you. I love mine. They are quality and so so soft. Great PJs are always a MUST! Oh I really like your gift guide. Such cute ideas. I love new shoes and am asking for that for Christmas! So crazy the holidays are already here! Yes, it feels like Christmas came so quick. Thanks for stopping by my page!